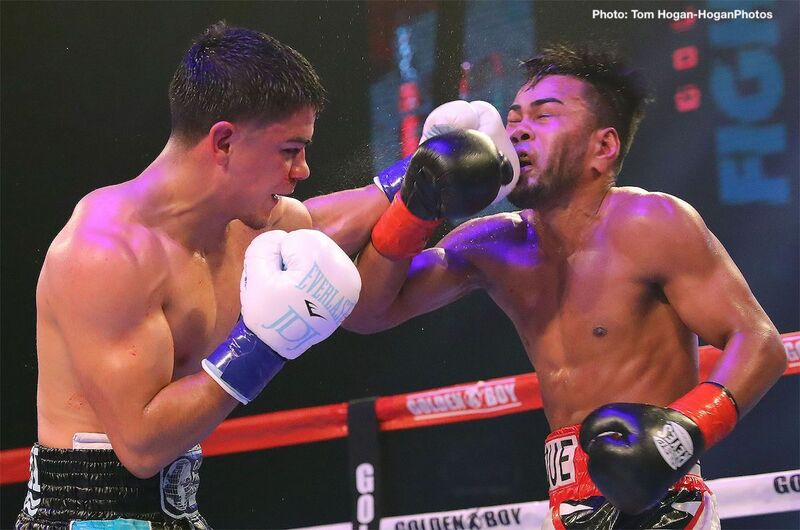 The inaugural edition of Golden Boy Fight Night on Facebook Watch kicked off with a bang as Joseph “JoJo” Diaz Jr. (27-1, 14 KOs) of South El Monte, Calif. defeated Puerto Rican warrior and WBA Featherweight World Champion Jesus Rojas (16-1-2, 19 KOs) via 12-round unanimous decision in an exciting main event from a sold-out Avalon Hollywood. Though he struggled to hurt Rojas, Diaz Jr. was more active in every round, which earned him the decision win with scores of 116-112, 115-113, and 117-111. Rojas remains champion despite the loss per WBA rules. In tonight’s co-main event, Golden Boy Promotions presented yet another battle between two of its undefeated prospects as Jonathan “Thunder” Navarro (14-0, 7 KOs) of East Los Angeles, Calif. defeated Damon “No Smilin'” Allen Jr. (15-1-1, 5 KOs) via stunning seventh-round technical knockout. Navarro was the stronger and more accurate of the two fighters, landing short right hands before forcing the fight to be stopped at 1:33 of the aforementioned round. Ferdinand Kerobyan (10-0, 5 KOs) of North Hollywood, Calif. scored a dominant six-round unanimous decision won against a very tough Jose Rivera (6-3, 4 KOs) of Manchester, Conn. in a middleweight bout. Kerobyan was victorious with three identical scores of 60-54. Aaron “Silencer” McKenna (5-0, 3 KOs) of Monaghan, Ireland defeated Rolando Mendevil (6-4, 4 KOs) of Sinaloa, Mexico via unanimous decision in a four-round welterweight clash. McKenna won with three scores of 40-36. Jose Vargas (5-0, 4 KOs) scored a third-round technical knockout victory against Leonard Reyes (7-18, 3 KOs) of Tijuana, Mexico in a scheduled four-round featherweight battle. The fight was halted at :36 of the aforementioned round. Rojas vs. Diaz Jr. was a 12-round fight presented by Golden Boy Promotions in association with Universal Promotions. The event was sponsored by Tecate,”THE OFFICIAL BEER OF BOXING,” and Hennessy, “Never Stop, Never Settle.” The fights took place on Saturday, August 11, 2018 at Avalon Hollywood. The action was be streamed live on Facebook Watch in the U.S. and globally on the Golden Boy Fight Night Facebook Page. Fans can catch all the fights by following the Golden Boy Fight Night Page.